Last Thursday (28th April 2016) was a lovely sunny day with a keen wind blowing mainly along the length of the lake, initially from the NW and then backing through W to SW by the afternoon. The wind was forecast to increase in strength during the morning but although there was a gusty 10 – 12 knot wind blowing as the eight Racers jockeyed for position on the Start line, it had dropped to just 4 or 5 knots by the end of the race . The PY Handicapping system is used by WS Racing and this means that 303 Double Handed boats (Mark Cayzer and Fay Watson plus their crews) get a one minute advantage over the 303 Single Handed boats, and the get a two minute advantage over Liberty (Brian Mac) and he got a seven minute advantage over the 2.4s (Peter Gregory and Peter Wagner). Once racing, the 303 fleet made good use of the stiff breeze at the beginning of the race to get away promptly from the Start Line and make good progress around the first lap. This resulted in four 303s completing their first lap before the 2.4s had started! Nevertheless, as soon as the two Peters finally got the green light in their 2.4s they set to overhauling the slower Liberty and 303 fleets. Peter Gregory’s experience and sailing competence was quickly apparent as he carved this way through the 303 fleet not just once, to unwind their “lapping” him but twice as he eventually caught up the back markers and it was only on the last leg of the fourth lap that he finally vanquished Kim Sparkes in her 303 just before rounding Mark D and finishing. Peter Wagner has only sailed a 2.4 a few times and therefore it wasn’t surprising that he was not able to make as much use of the 2.4’s superior speed as Peter G had done. This meant that Kim and Steve held him off during the last lap forcing him into a hard fought 4th place. The other 303s and Brian all finished within a few minutes of the winner. 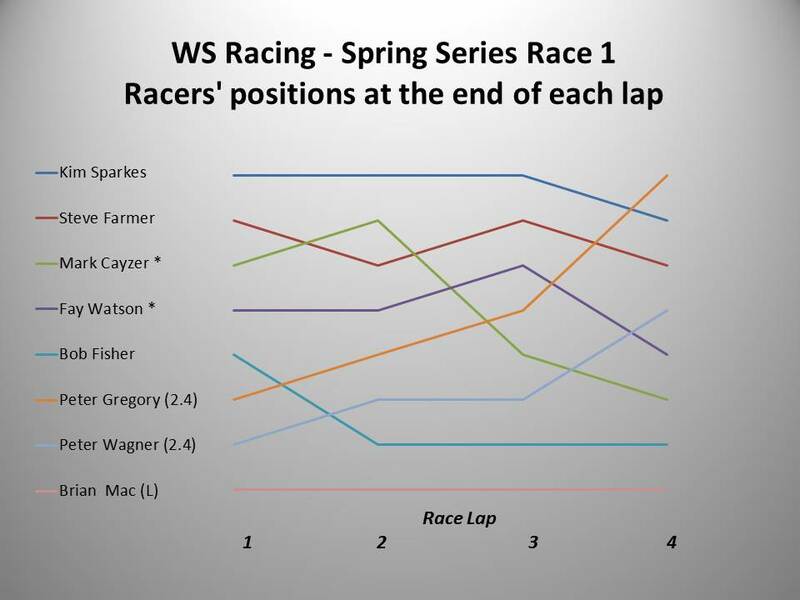 In summary, Race 1 was a great start to the season and allowed eight very eager and competent helms/crews to shake themselves down. The wind’s decrease in strength and variation of direction challenged all helms to ensure they were heading in the right direction between the Marks and to set their sails most effectively – and differently on every lap! All-in-all, an excellent performance by all involved. We definitely need to get the third 2.4 out! Kim or Mike or anyone else, are you game? Well said Peter W. It would be great fun to have a third 2.4 on the water. Peter, could you write a brief 2.4 SAILOR’S PERSPECTIVE to encourage those who might be thinking of taking the plunge (well not literally)? Yes, sure. Where do you want me to write it? It was my first time racing a 2.4 metre in a race, since starting to learn how to sail it late last year. It was a nice breezy day for the first sailing race. As you may all know I am normally a Liberty racer, however this year I wanted a real challenge. Luckily, this year, Peter G joined us, who you may not know is a real expert in the 2.4 class. That showed last week when he won the race. I remember two weeks ago when he first tested his boat on the lake ‘wow, these boats can go like a rocket!’. Last week in the afternoon, I felt the sheer power and speed of these boats for the first time since sailing them. These boats are in a different area to the 303s and the Liberty. As you are aware, we do have 1 more 2.4 at Chipstead. I would encourage any of you who wants a challenge or who wants a change to try it out. They have passed my test of not capsizing, though you do get very wet! Thank you Peter W. So WS Racers (present and future), what’s holding you back from trying out sailing a 2.4 and, if you get on with it, racing against the two Peters?